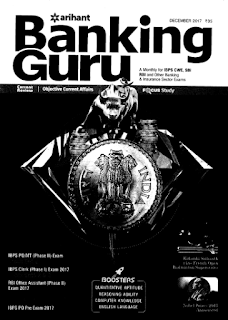 Banking Guru December 2017 is useful for all banking exams. Aspirants preparing for Bank JOBs must view this, This pdf is in bilingual. Candidate can download this pdf in Hindi or English Medium as per their medium. This is published by Arihant. You can buy this pdf in market too as Hardcopy is more understable than a soft one.